A couple more cards to share with you that I did for the latest Frantic Stamper release called Victorian Christmas. sponged on colour using Tim Holtz Barn Door and Evergreen Bough until there was good coverage. 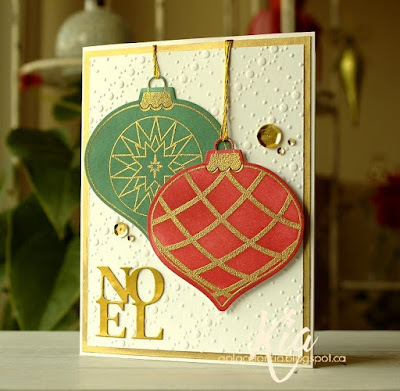 I embossed my background using a Sizzix Embossing Folder and then made another mat using my Gold Leafing Pen to mat the border. I hung my ornaments using several layers of gold metallic thread, layering the top ornament on foam dots. I die cut the Noel sentiment using metallic gold cardstock and added a few sequins to finish. 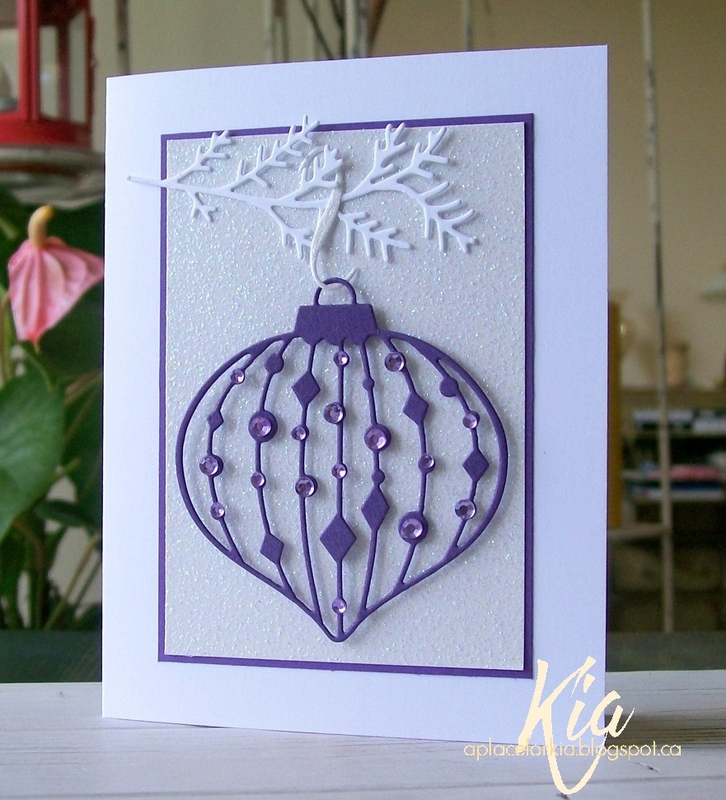 For this ornament card I used the Jeweled Finial Ornament die and the sprig from the Ornamental Swag die. 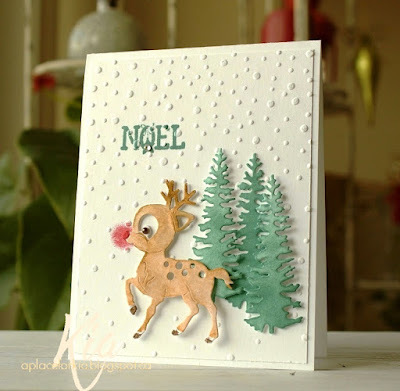 I kept it very clean to show off the Ornament, which can be done in so many different colours. I used metallic purple cardstock, so pretty IRL, but, unfortunately it does not photograph well. I added purple crystals to the ornament. The background is white glitter paper, matted with purple cardstock. 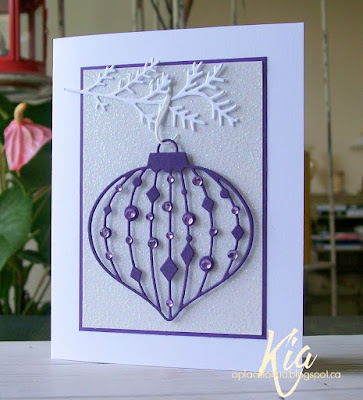 Products: Frantic Stamper Dies Finial Ornaments, Finial Ornaments Background Die, Jeweled Finial Ornament, Ornamental Swag, Noel Square Vignette Die, Sizzix Snowflurries Embossing Folder, Kaiser Crystals, Sequins. and touched just touched it with my brush and let the paint spread. I added the matting using the colours from the image and attached to my embossed background. I then printed the "beauty/beautiful" symbol and went over it with my silver glitter pen several times and attached it with foam dots. Thank you for having a look today. Products: Art Neko Stylized Cherry Blossoms Hanging Over a Pond, Taylored Expressions Leafy Vine Embossing Folder, Zig Clean Brushes, Simon Says Stamp Stitched Rectangles, Silver Glitter Marker. I hope you like my Riviera Pears. Hello to all our furry friends. This card has me smiling for a couple of reasons. I made this for the Dare to Get Dirty challenges and the day I did this my windows were being changed. It fortunately was a coolish day, but oh what a mess, and 5 guys running around my place. I sat in a chair off in the corner and all I had room for was my card and my box of Zig's. But, I was happy! I was doing very light painting, so I could keep adding colour as I wanted it. I had the watercolour panel already attached to my layers before I started, which is another reason I kept everything light, so the watercolour paper would not stay flat. I did have to climb over everything to retrieve my sequins ... a must to finish my card. Thanks for having a look. 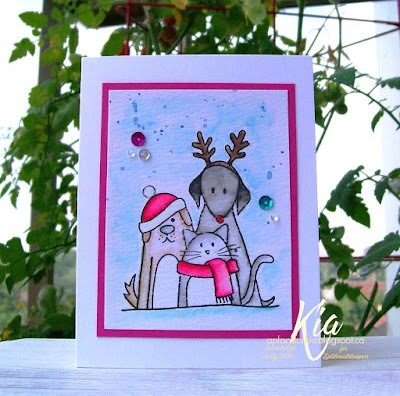 Products: Simon Says Stamp Furry Friends, Zig Kuretake Clean Brushes, Sequins, Papers are Neenah, Bazzill, Ranger Watercolour. I would have to say this is one of my favourite cards that I made for the Dare to Get Dirty challenges earlier this month. I sponged the colour on my cardstock and spritzed with water and did some drips with my paint brush. I added some flicks of paint using the same colours of Tim Holtz Distress Inks. With the assistance of MISTI , I die cut my flowers using 40lb vellum. 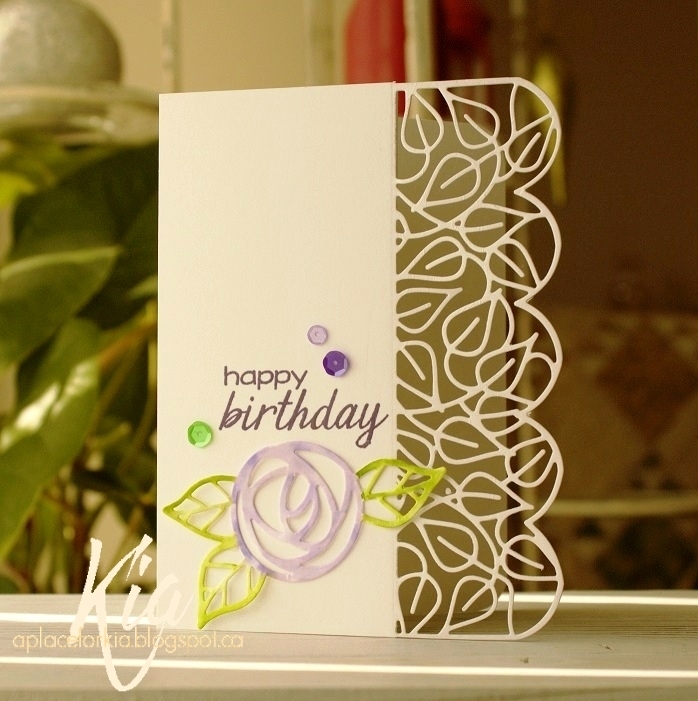 and stamped the floral image then heat embossed using gold embossing powder. I added with matte glue and some foam dots arranging up the left side of my card. I added the hearts and my sentiment, which was also heat embossed using the gold embossing powder. And of course, my trademark sequins to finish. I was just about to mail this off to a friend and noticed I had not shared it on my blog. 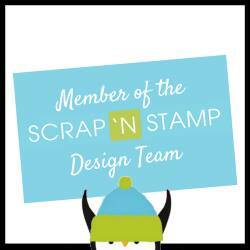 I did this for the Dare to Get Dirty challenges at Splitcoaststampers. I love this image and should use her more. I stamped her and my sentiment using permanent black ink and did splashes of colour using Winsor Newton watercolours. I also did the splatters with the Winsor Newton paints and added white splatters in acrylic paint. I matted in the black cardstock and added my signature sequins to finish. I really like the way she turned out and I think my friend will too. Thanks for looking today. Products: Unity Stamps Harmony Girl, Stamplorations Noteworthy, Simon Says Stamp Intense Black Ink, Winsor Newton Watercolours, Sequins. I am sharing this card with you today showing a technique I had not done before called Faux Patina. I did not want a darker more usual patina, choosing instead greens and blues. I sponged my colours using Tim Holtz Distress Inks Evergreen Bough, Tumbled Glass, Peacock Feathers and Cracked Pistachio. 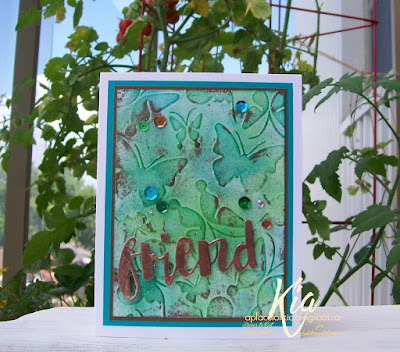 And for the patina I used Copper Embossing Powder, which I also used on my sentiment die. I propped up the sentiment on foam dots, and to finish, I added my trademark sequins. I loved this done with just the inks, so I can see myself having another go at this using clear embossing powder. 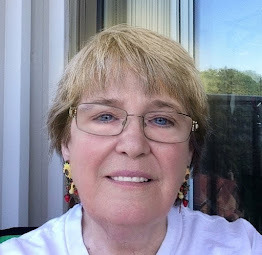 Thanks for taking a look, have a great day! 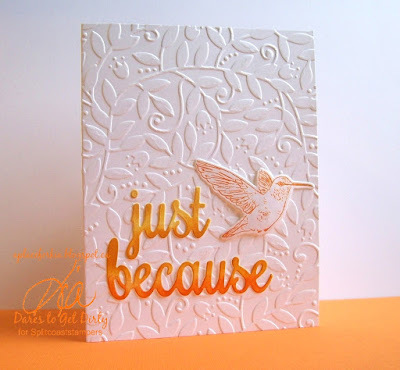 Products: Ecstasy Crafts Butterfly Embossing Folder, Tim Holtz Distress Inks, Simon Says Stamp Sentiment Die, Copper Embossing Powder, Clear Embossing Ink. Sequins. 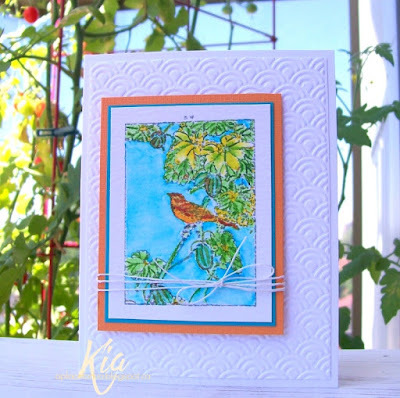 I love this card and I suppose it is because of the bird's. I stamped them in various spots and watercoloured using my Zig Brushes. I added complimenting layers of cardstock and the vellum sentiment banner with a small edge die, and my trademark sequins. I cannot wait to use this set again. I hope you like it too. Have a great day everyone. The Clean and Simple challenge at SCS is about cards for someone under the weather. I do have a stamp somewhere that says "feel better" which is what I planned on using, but I could not find it! So, when someone is not feeling well, I like to send hugs too. 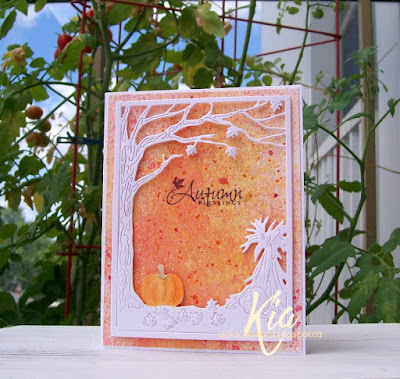 I sponged on colours using Tim Holtz Distress Inks Fossilized Amber, Dried Marigold and Ripe Persimmon. I might have some scattered straw somewhere in there as well. I then die cut my panel and used my Misti to stamp my sentiment using Brushed Corduroy. I added the Bakers Twine and propped up my panel on foam strips. 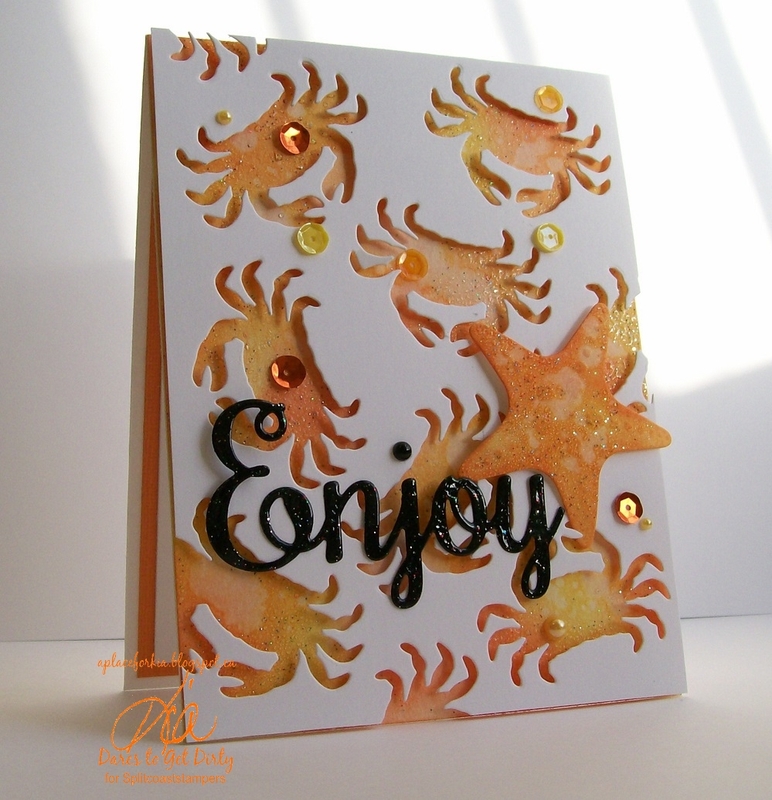 And, my signature sequins were added to finish my card. I hope you like it. Thanks for having a look. Products: Hero Arts Large Flower Stencil, Simon Says Stamp Flower Friend, Simon Says Stamp Stitched Rectangles, Bakers Twine, Tim Holtz Distress Inks, Sequins, Crystal. 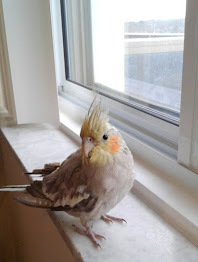 Meet Sweet thanks. 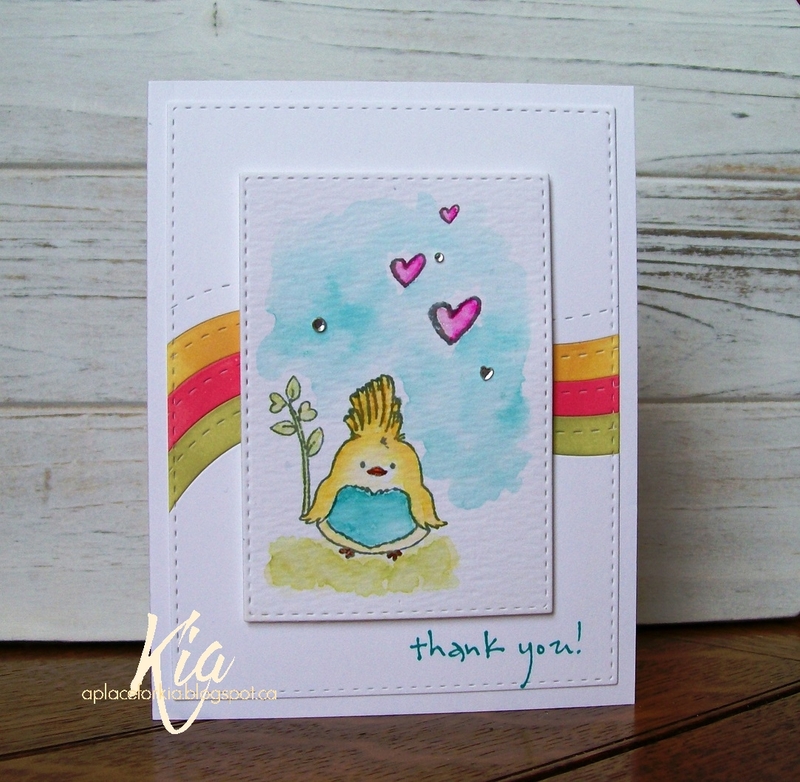 I am in need of some thank you cards and I think this little birdie says a sweet thank you. I watercoloured using Tim Holtz Distress Inks and Zig Brushes. On my background I sponged on some of the same colours I used for my birdie. I added a few small crystals, with one being a heart and propped up my watercolour panel on foam strips. I waited to stamp my thank you until my card was complete and the thank you is a wood mounted stamp, and wood mounts and I do not get along! So I placed my finished card in my Misti and lined my wood stamp up to the bottom of my watercolour panel - yippee, it is straight! I hope you enjoy Sweet thanks. Have a great day! 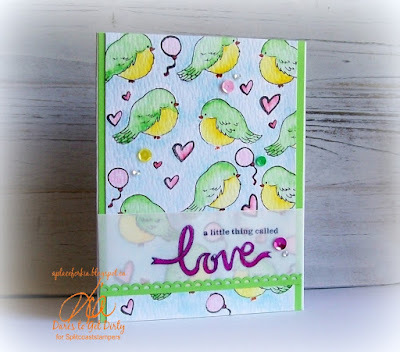 Products: Winnie & Walter So Tweet, Penny Black Sentiment, Simon Says Stamp Stitched Slopes, Simon Says Stamp Stitched Rectangles, Tim Holtz Distress Inks, Zig Brushes, Crystals. I am working today with Art Neko's Framed Bird on Gourd Vine on Gourd Vine stamp, which I watercoloured using Zig Brushes. I read that the Gourd Vines associated with the yellow flowers are usually annual plants which are rather bitter. But I loved the idea of the yellow flowers for my card. 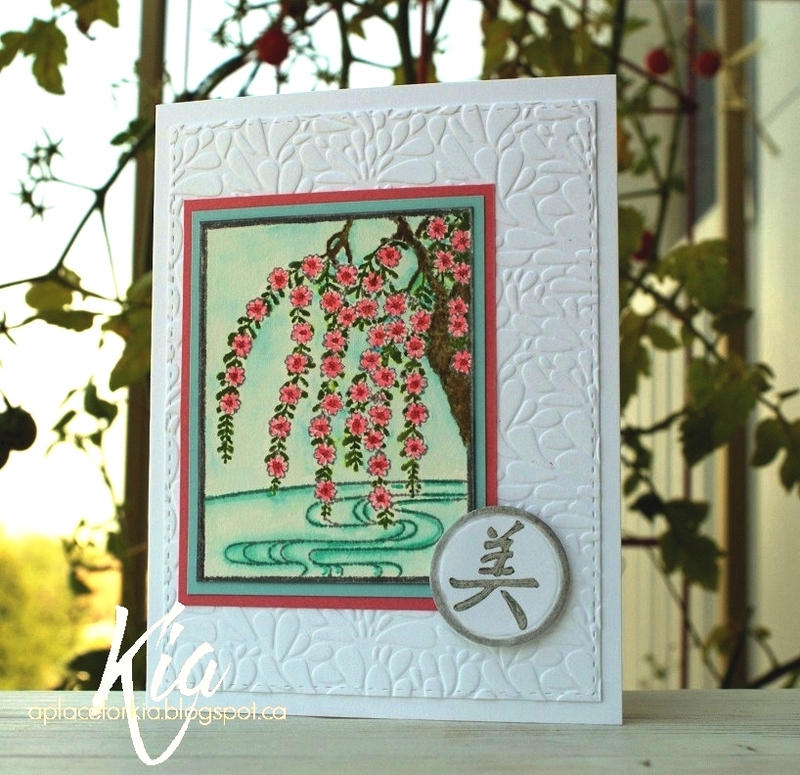 I thought using the Zig brushes was best as they are perfect for detailed stamps such as this stamp. I matted my image using Bazzill cardstock in colours that I used in the watercolour, and then added Hemp Cord. I think the darker cardstock against the orange cardstock brings out the colours beautifully. 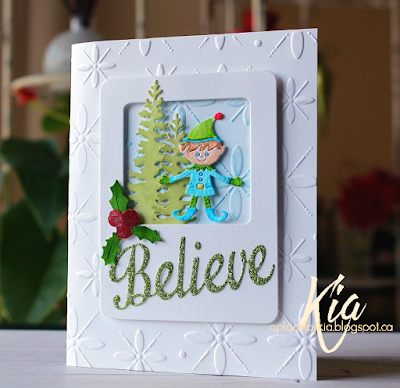 I embossed my bottom panel for added texture to my card and attached my image on foam strips. I hope you enjoy my card today. Products: Art Neko Framed Bird on Gourd Vine, Kuretake Zig Brushes, Hemp Cord, doCrafts Art Deco Scallop Embossing Folder. My Bisters need a bit of help today. I have always been a tad disappointed in how dull the Bister colours are. So, I gave them some assistance by using my watercolours ... I so often find myself going for my Winsor Newton paints... the colours do not disappoint. I put down the Bister powders and spritzed with water then dried my panel. I then spritzed on some watercolours to brighten the colours, and I am finally happy with the results. I think in the future this is how I will treat the Bister powders. 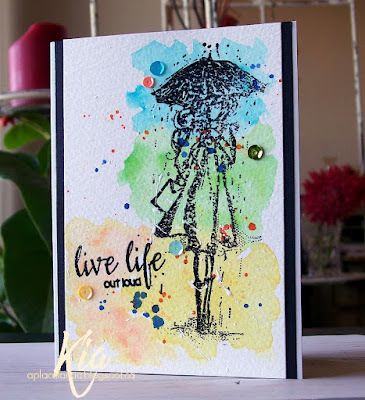 Once all was dry I stamped, with the assistance of MISTI, my sentiment using Simon Says Stamp Intense Black Ink. Thank goodness for MISTI as I had to stamp it 5 times due to the watercolour paper. I matted my panel with Bazzill black and attached to a rich turquoise base ... that is unusual for me as well. It has a beautiful rich sheen to it ... I have been dying to use this paper. I hope you like "True to herself" and thanks for having a look today. 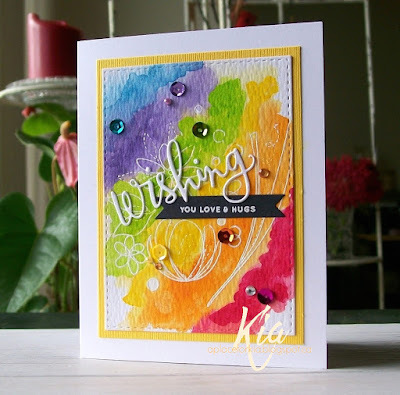 Products: Bister Paint Powders, Winsor Newton Watercolours, Unity Stamps She Remained True, Sequins. You all know I love this die by Frantic Stamper, and of course that would be because I designed it in my head and explained it to the talented Kathy Berger who made it came to life, and it is fabulous. This card has been a work in progress over the last couple of weeks. 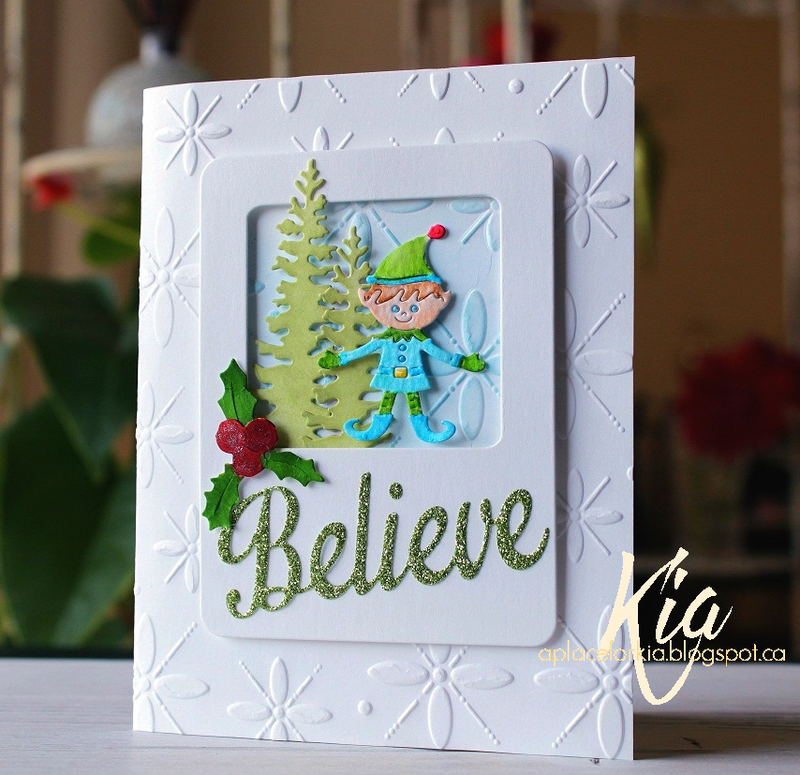 The Inspiration Challenge at Splitcoaststampers a couple of weeks ago was on a Pinterest Board full of Paper Art. I could not play at the time, but immediately thought of this die when I was looking at the artwork. 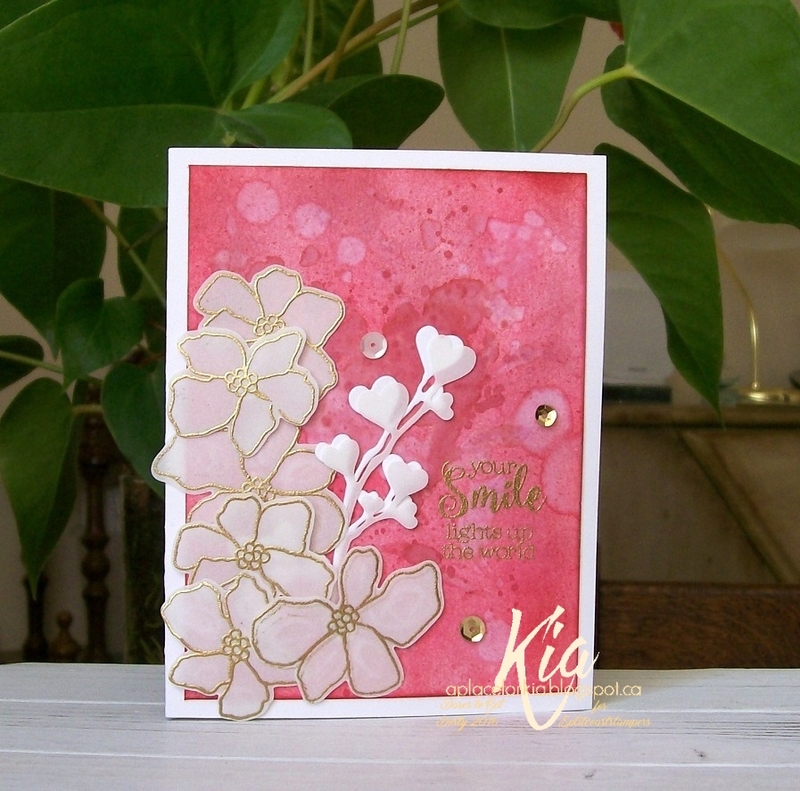 Then I received an email about the CAS Mix Up Challenge, and back I came to this die cut. I knew I wanted to play in the challenge. But, I do not have spray inks, so I made my own. I have done this in the past and it works for me, maybe it will work for some of you rather than buying spray inks. I use my Winsor Newton Watercolours to make my sprays, and a tiny Ranger spritzer bottle. I add ink to the bottle with my paint brush, heavy on the ink and not so heavy on the water that I add, also with my paint brush. I only make a little, enough for the project I am working on, and I use the same bottle for all the colours I want to use, not cleaning in between colours. For this project I used New Gamboge, Cadmium Yellow, Cadmium Orange and Permanent Rose. As the bottles near the end of the paint they sputter, also another part of making my own that I love, it saves me the time of doing splatters with my paint brush! I watercoloured only the pumpkin, using Zig Brushes. I styled the harvest panel and propped it up on foam strips attaching to my spritzed background. I am not sure where the stamp came from, but it is for the stamping part of the challenge, which is Stamping, Sprays and "your choice", mine being die-cutting. I hope you like my card, and thank you for dropping in today. Products: Frantic Stamper Fall Harvest Panel, Winsor Newton Watercolour Paints, Kuretake Zig Brushes. Another card I did for the Dare to Get Dirty Challenges, which I cannot divulge. 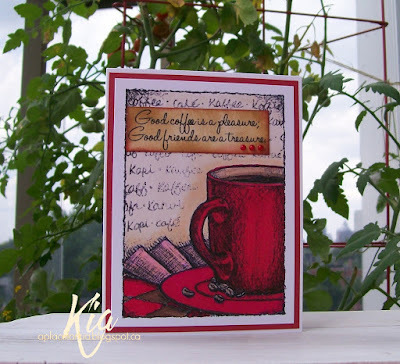 But, I can say that I took myself out of my comfort zone with this card, and I ended up loving the final results. Imagine that! 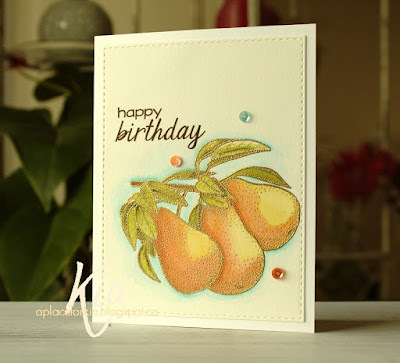 I watercoloured the background loosely with Tim Holtz Distress Inks. I used Zig Brushes and doCraft Markers on the rest of the image. Where there were stars I added crystals in smoke and navy. I added Wink of Stella to the windows. I hope you enjoy My Secret Place. Have a great weekend. 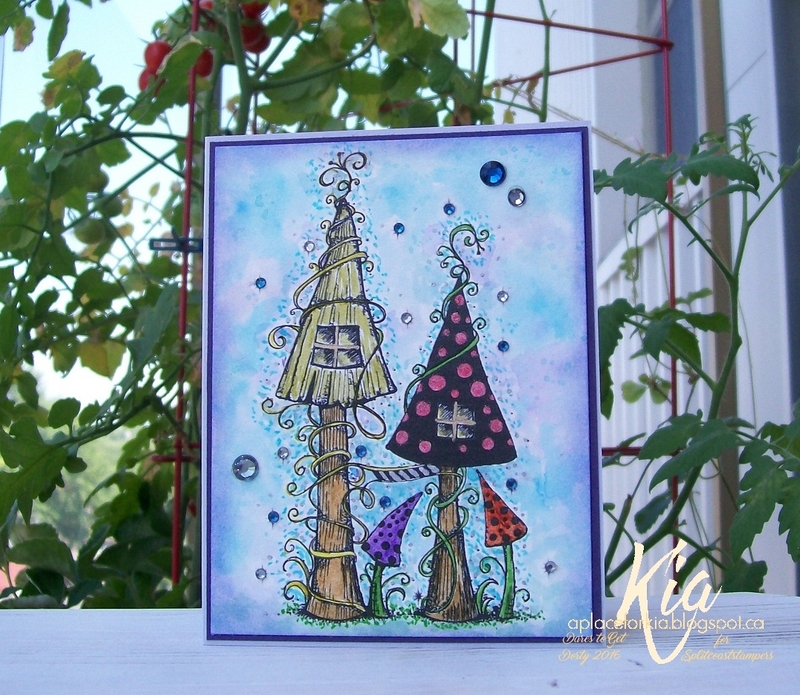 Products: Lavinia Stamps Mushroom House, Paper Garden, Bo-Bunny Crystals, Tim Holtz Distress Inks, Zig Watercolour Brushes. 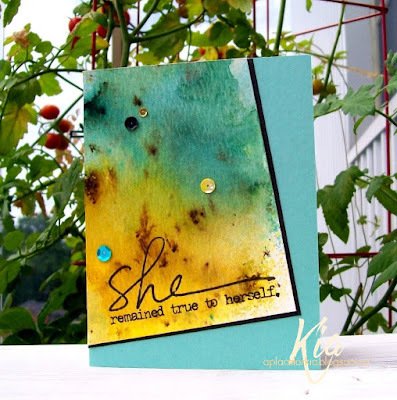 It has been Dare to Get Dirty Challenge Week at Splitcoaststampers which equals a busy time for Dirty Girls. I am blessed to be part of this fantastic group of artists. In the next couple of days I will share some of the cards I did for the challenges. Meet "Flamingo Party". I can't give away the details of the challenge, but I can share a bit about my card. I die cut my Flamingo out of watercolour paper. 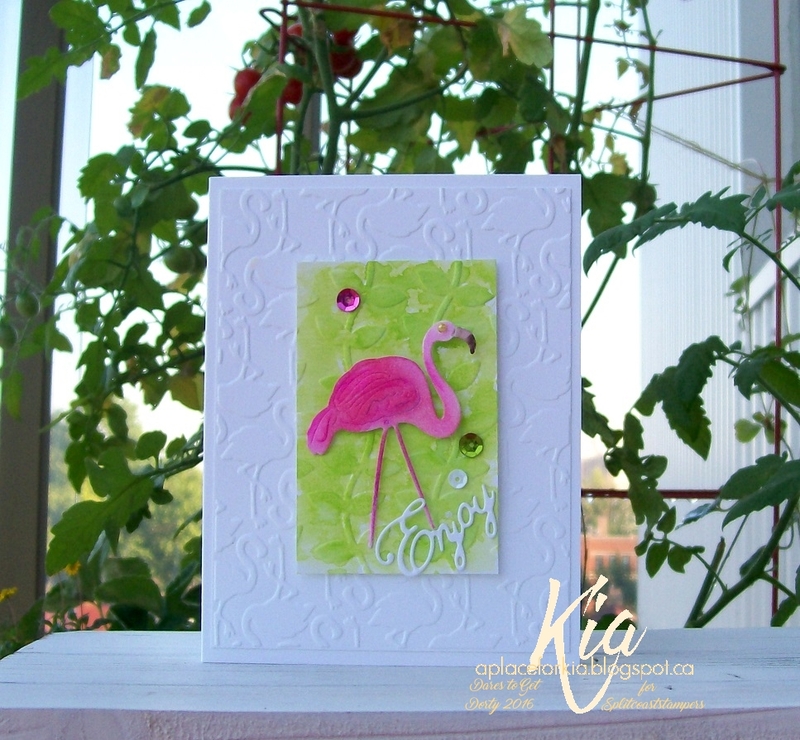 I put down some Tim Holtz Distress Inks Picked Raspberry on my craft mat and spritzed with water, then dragged my flamingo through it. I added more ink with a paint brush. 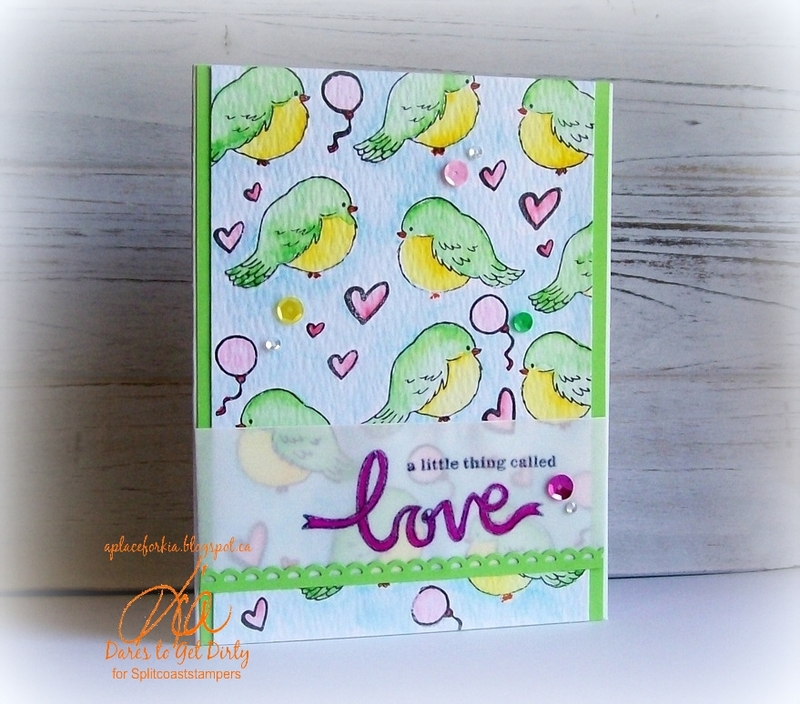 I did the same for the green background, first embossing then dragging through Tim Holtz Distress Twisted Citron, and I must say I love this colour. My back panel is embossed with my flamingo embossing folder and my green panel is attached on foam strips. And, to finish I added the "Enjoy" sentiment and a few sequins - even Flamingo's like sequins. It worked, one of the comments on this card over at Splitcoast was a request for my Flamingo to come over and play with "her" Flamingo! Hope you like her. Thank you for having a peek. 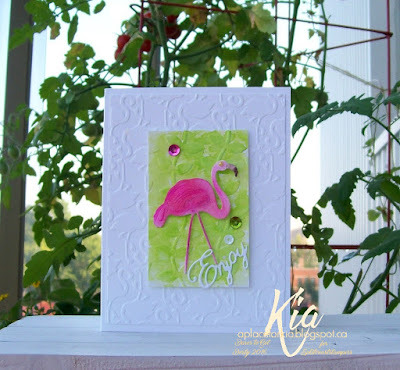 Products: Frantic Stamper Lawn Flamingo, Couture Creations Pretty in Pink Embossing Folder, Marianne Designs Leaf Embossing Folder, Cheery Lynn Designs Enjoy, Sequins, Tim Holtz Distress Inks. 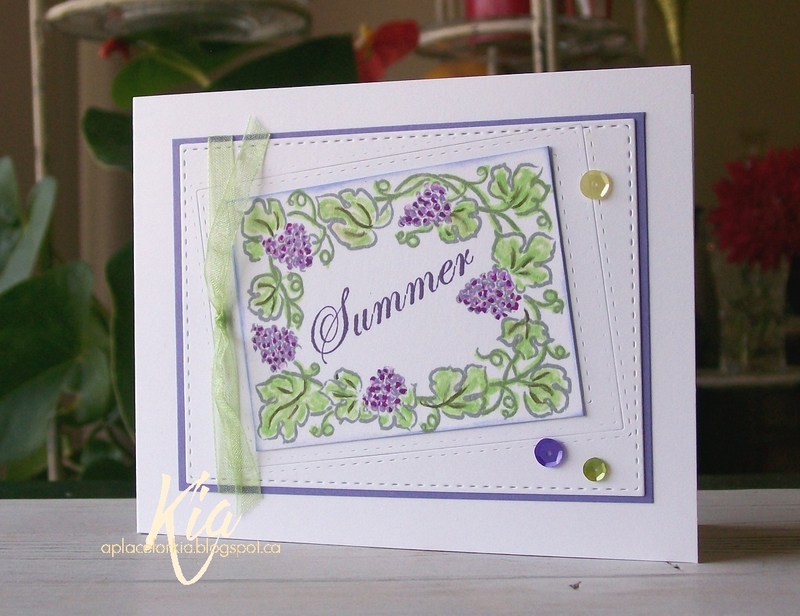 A quick card that I did for the Clean and Simple Challenge earlier this week at Splitcoaststampers. This is a digital stamp that I have had for some time and only now have used. I used Spectrum Noir Markers to colour and matted with Bazzill red paper. I sponged on the distressed ink colour for the sentiment. Very simple and easy. 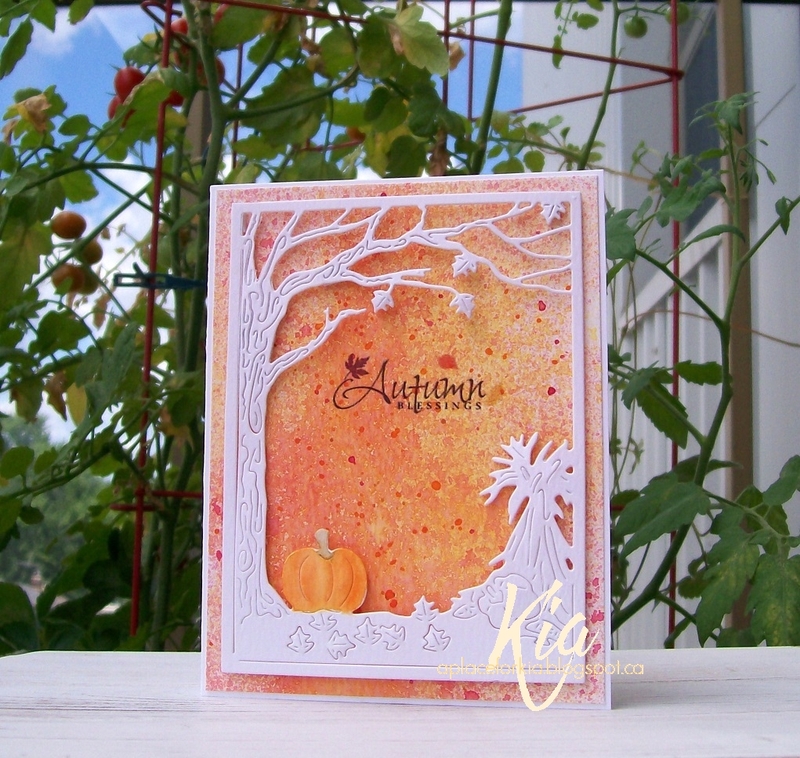 The last of the cards that I did for the recent Frantic Stamper release called A Crisp Fall Day. For this card I had in my mind a tic tac toe look, but I wanted the roosters on the diagonal. So I fiddled around until I got the look I wanted, which is above. 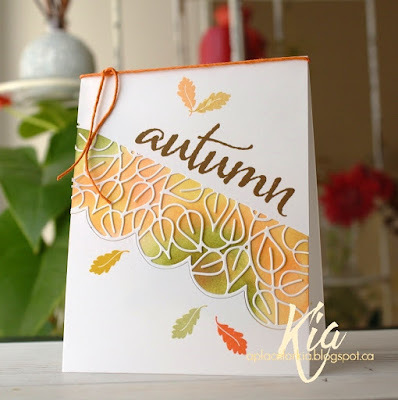 I also wanted to use the plaid designer paper, and I wanted fall colours. Do you do these things to yourself too. Giggles! In any event, I am also not the best for lining up things, so I took assistance from the stitched square die in the Elementals Square Basics Set #14 cutting the 9 squares needed from the different colours. After attaching the squares it was so easy to line up the Peeking Give Thanks squares. I matted with the orange in the plaid paper for contrast, and that is all that was needed in my humble opinion. I really like it, and hope you do as well. I love bright colours, does it show? They make me happy, so when I can, I use them, hence my bright Pumpkin Patch. I watercoloured the patch using Winsor Newton watercolour paints and added fallen leaves under my patch for extra colour, which are also from Frantic Stamper and called Petite Oak Leaves. 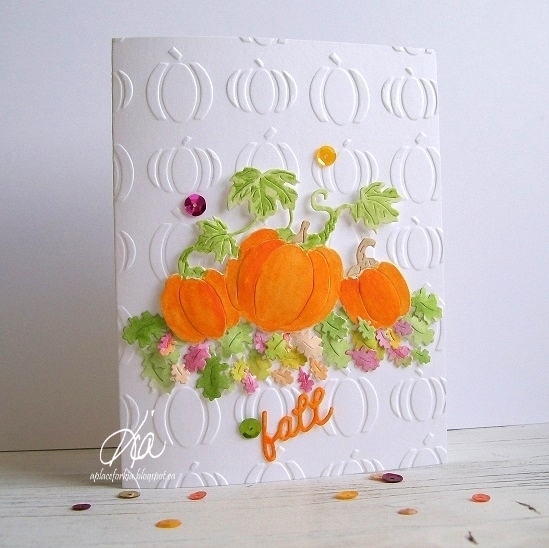 I attached everything to my card base which I embossed using my pumpkin embossing folder. The fall sentiment is from the Fall Harvest Panel. This finishes the cards that I did for the latest release from Frantic Stamper. The next release will be September 1st, so I hope you will visit to see what the design team and myself do for that release.